Software to speed up the way you create your RAMS Risk Assessment Projects. Our RAMS Risk Assessment Software is an easy way to produce professional RAMS risk assessments quickly. It's easy to pick up and use and is our most popular selling product today. What's more, we pride ourselves in providing great after sales phone/onscreen training and customer technical support. 80+ prefilled risk assessment templates that can be made site specific. Add your own company logo to the front page of the finished PDF. Add electronic signatures to each risk assessment automatically. Store and enter customer details with our integrated client and site database. A company logo facility to tailor the design to your company. Project builder - allowing you to select risk assessments to build up a finished PDF project to email to the client. The controls and planned methods are listed for each risk assessment. These can be modified as required. If staff adhere to the controls and planned methods to reduce risk, it results in a revised (reduced) risk rating. Click to view a sample risk assessment project. Which Risk assessments are included in the software? 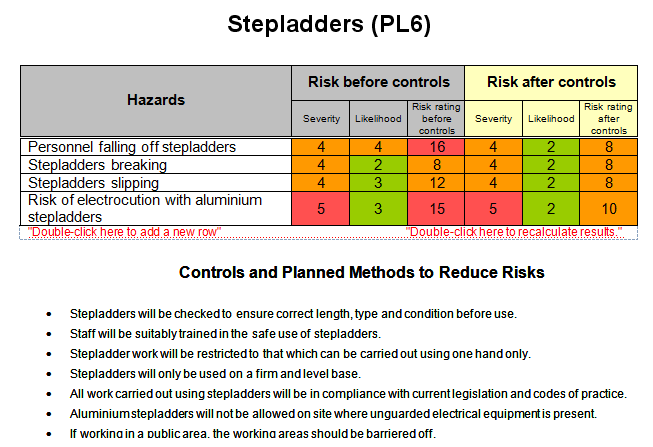 Click to open an example of a finished PDF Risk Assessment created with the software. To enquiry about Risk Assessment (RAMS) Creator Software, please contact us. Note: There is no monthly fee or limit on use with this product. You own it for life with no restrictions. Note: The software requires a Windows PC/laptop/tablet running Microsoft Office 2007 or above. Hollycroft Software recommends Greens Consultancy for bespoke Health and Safety requirements.